This is a series focused on personal journey with eczema while managing a certain aspect of life. Today, we have a father, known as Spanish Key, who has a daughter with eczema and multiple allergies, and shares how he manages her daughter’s conditions. Spanish Key blogs at End Eczema and also started the Eczema Map Project. Marcie Mom: Hi Spanish Key, it’s good to have a dad to share. Let’s start with you sharing a little of your daughter’s eczema and allergy history. Spanish Key: My daughter’s four years old. She’s got moderate-to-severe eczema and mild asthma. Her history is part of an ongoing family history of atopy, since my grandfather, a cousin, and myself all had or have eczema. Shortly after she was born we noticed the eczema and blood in her stool. The blood was apparently from food allergies through breast milk. We had her skin- and blood-tested and she was positive to virtually everything. The allergist said we should feed her nothing but rice, banana and zucchini. 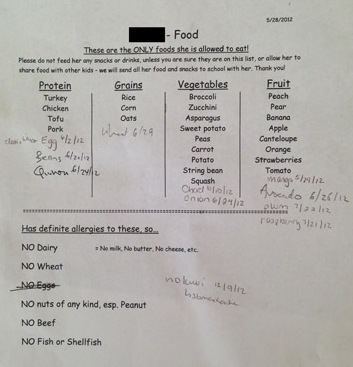 Obviously that was nutritional nonsense so we asked her pediatrician who expanded the list to nine items including chicken and carrot. She ate nothing but those things for two and a half years—and my wife, while breastfeeding her, had to avoid all the major allergens as well. Her eczema flares up worst on her hands. It happens every six months or so. In between we see it on her feet and scattered all over. Asthma shows up when she gets sick with a cold. Marcie Mom: You’ve shared about your daughter’s allergies – which would be the ones which have been tested positive and for which she experienced moderate to severe reactions? Spanish Key: Things are changing over time. We get her skin- and blood-tested once a year, and challenge her orally with new items. There was an exciting moment when we went from a short list of things she COULD eat to a short list of things she COULDN’T eat. Right now the known positives are nuts (all kinds), dairy (all kinds), and sesame. Just last week we introduced beef and coconut. She had no reaction to those. We also know she’s allergic to horse dander—she has horse-riding lessons every two weeks and always comes back blotchy-faced and itchy, so we included that in the testing. Her dairy and sesame allergies don’t obviously make her skin flare up. Instead, she vomits almost immediately. The allergist says this is not the typical reaction but it’s still most likely an allergy and not an intolerance. Our biggest fear is not eczema but that she’ll develop an anaphylactic nut allergy. We are not sure whether we should be avoiding nut products ourselves. We eat nuts and peanut butter in the kitchen. This might be good because it is exposing her to small amounts and inducing tolerance—or it might not. Marcie Mom: How do you manage so many triggers and allergies? Does it affect her nutrition and lifestyle? Spanish Key: Most of her life we have made all her food from scratch. I do it myself since I’m the cook. I know what goes into her food. In the last year or so we’ve let her have some packaged candy after we read the ingredient list. For the first four years, we gave her special vitamin powder http://www.solacenutrition.com/products/nanovm/nanovm.html, because all the children’s vitamin pills we could find contained coconut. But as of two weeks ago, she’s been taking regular kiddie vitamins and loving them. I do my best to balance her diet. But it’s frustrating because she either was a picky eater to begin with or has become one, from lack of variety. Now she is able to eat a wide variety of foods, but she doesn’t like many of them. In practice she eats a lot of pasta, rice, and soy. These foods are not so great for her teeth which are in worse shape than her brother’s. She’s getting enough calories—actually we worry she might be a bit chubby—but she really ought to eat more vegetables. But you could say that about me too! 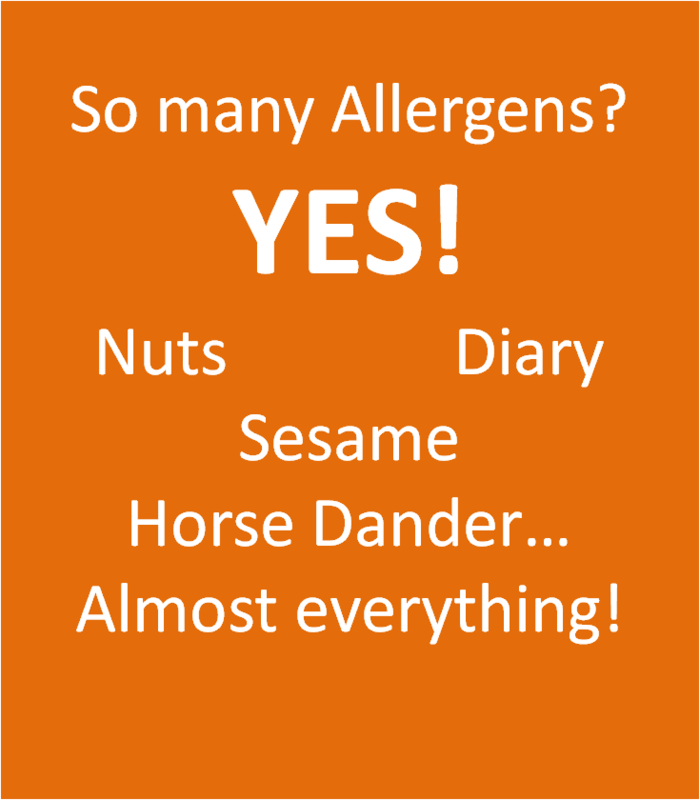 Marcie Mom: One final question – what would be your top 3 tips to another parent whose child tested positive to lots of allergens? Make all their food yourself from scratch. If you give them packaged food, always check the ingredients. Always. Most soy sauce contains wheat. Most bread and margarine contain milk. Vitamin pills can contain nuts. And make sure their teachers know that they have food allergies, because treats often get shared at school. Marcie Mom: Thank you so much for sharing your journey managing your child’s eczema and multiple allergies (and from a dad’s point of view! ).